Privacy is a luxury in the social media sphere and it becomes more important with the rise of cyber awareness. The trend has shown that people prefer to use Direct Messaging or the ‘share’ option to convey their thoughts to their friends and family over commenting and tagging on the post itself. 😯 This is to probably establish a sense of confidentiality and limit the public from viewing their social activity. Nearly all internet users (95%) use legacy social media or direct messaging; this finding is uninfluenced by nationality, gender, or age. Staying connected and constantly “checking in” pervades Arab culture, as demonstrated by nearly eight in ten (79%) using social media or direct messaging at least once a day. Text messaging has traditionally been a form of personal, one-on-one communication, but direct messages are also used to communicate with larger groups of people, thus expanding its appeal as a form of social media. Approximately one-third of direct messages (sent or received) are among groups. Almost six in seven belong to a direct messaging group, primarily friends and family, and three in ten belong to news-related direct messaging groups. The sphere of what might be considered “social media” is expanding, as people increasingly turn to instant and direct messaging services. 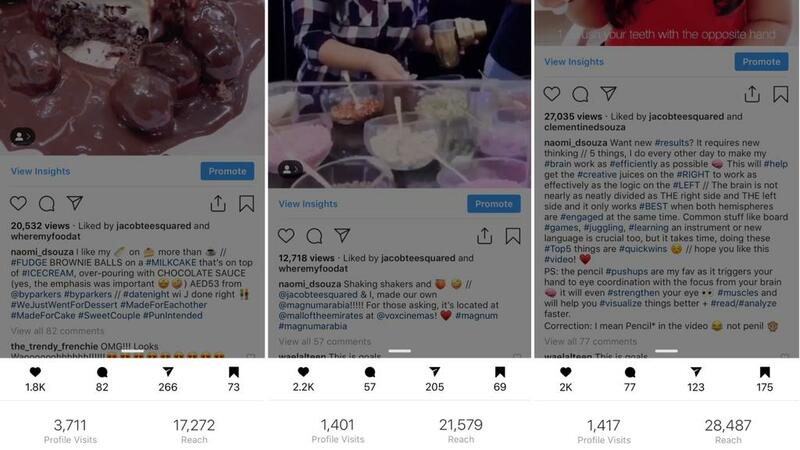 I would term the above screenshots engagement (from my Instagram @naomi_dsouza) as ‘Ghost Engagement’, something that only I can see and the public can’t. You will notice how the comments are minimal but shares and bookmarks are 100/200++. However, I foresee Instagram coming up with a feature, just like Facebook, where the number of shares would be shown beneath the image/video. Unfortunately, a bloggers worth, credibility, and engagement are calculated using their likes, followers AND comments, if it’s too low, we sometimes resort to comment pods, if we don’t have as many comments, the clients end up being unhappy… It’s like the saying, “What you see, is what you believe” (i.e. no comments, that means no engagement?). wonderful read and cant agree more.